In an effort to provide additional vertical space for displaying quilts, DWR Custom Woodworking has added the Quilter’s Step Ladder. 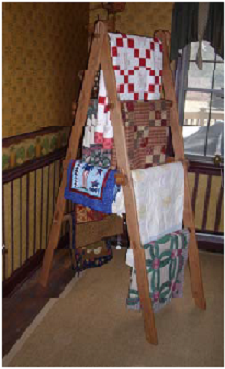 The Quilter’s Step Ladder provides seven round rungs for the 75” or nine round rungs for the 90” to display the quilts, three or four on each side and one at the top. The two side supports can be used to display smaller quilts or fabric. Assembly is the same as the other ladders, tapered pins through holes in the rung ends then tapped in with a mallet is all that is required. Screws attach the side supports to the rungs. 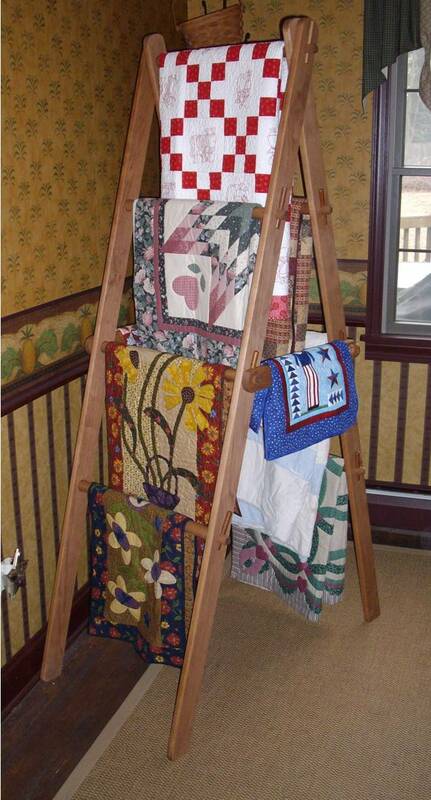 The Quilter’s Step Ladder requires a 21” x 40” space on the floor. The height of the ladder rails is 75” or 90”. The first rung is 24” from the floor and the remainder of the rungs are spaced 15” apart. Please review the chart below for wood species and pricing.